And now we have ABC's Fall 2016 premiere dates! ABC will launch the 2016-17 season with a stable of returning hit shows and five new series to join the schedule. The new season kicks off with Dancing with the Stars making its 23rd season premiere on Monday, September 12 from 8-10pm. ABC will have the 68th Primetime Emmy Awards on Sunday, Sept. 18. On Tuesday, September 20, ABC will have a two-hour Dancing with the Stars Results Show leading into the season premiere of Marvel's Agents of SHIELD at 10. ABC's Wednesday comedies launch on Sept. 21 with The Goldbergs at its new time of 8pm leading into new comedy Speechless starring Minnie Driver at 8:30pm. Megahit Modern Family and black-ish follow in the 9pm hour. Then at 10pm, new drama Designated Survivor starring Kiefer Sutherland in his return to primetime premieres. On Thursday, Sept. 22, ABC's TGIT block returns with Grey's Anatomy at 8, new drama Notorious inspired by the true-life stories of famed criminal defense attorney Mark Geragos and cable news producer Wendy Walker, airs at 9pm as Scandal is held to mid-season due to Kerry Washington's pregnancy. At 10pm, the season premiere of How To Get Away With Murder will premiere. The next night on Friday, Sept. 23, the consistent Friday line-up returns with Last Man Standing at 8, Dr. Ken at 8:30, Shark Tank at 9 and 20/20 at 10. ABC's Sunday dramas return on Sunday, Sept. 25 with veteran Once Upon a Time at 8, followed by sophomore seasons of Secrets & Lies at 9 and Quantico at 10. AFV will premiere a week later on Sunday, Oct. 2 at 7pm. New drama Conviction featuring Hayley Atwell (Marvel's Agent Carter), will launch on Monday, October 3 at 10pm due to Presidential Debate on Monday, Sept. 26. ABC's Dancing with the Stars will likely air on Tuesday, Sept. 27 that week due to the debate on Monday. And finally, ABC's Tuesday comedy block will launch on Tuesday, Oct. 11, due to the VP Debate on Oct. 4. The Middle moves to its new night at 8pm, followed by new comedy American Housewife starring Katy Mixon (Mike and Molly) at 8:30pm. Fresh Off the Boat and The Real O'Neals will air from 9-10pm. It's #SundanceTVMovietime and SundanceTV is dialing up Peter, Raymond and Egon for an all-day marathon of Ghostbusters and Ghostbusters II, starting Saturday, July 16 at 11:00 a.m. EST/10:00 a.m. CST, to celebrate the reboot of the film, which hits theaters Friday, July 15, 2016. 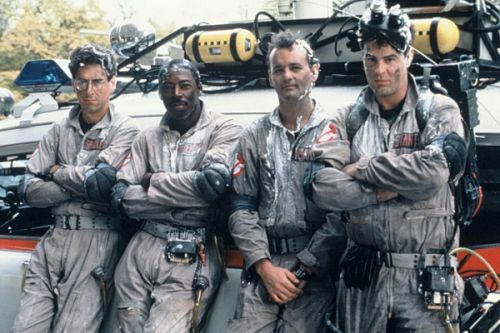 Viewers can settle in to watch their favorite team of paranormal experts take on ghosts, ghouls and Marshmallow Men alike in these classic comedies starring Bill Murray (Groundhog Day, Lost in Translation, Caddy Shack) Dan Aykroyd (The Blues Brothers, Driving Miss Daisy, Coneheads), Harold Ramis (Groundhog Day, Analyze This) and Sigourney Weaver (Avatar, Alien). Both films will air three times each during the day from 11am-2am.